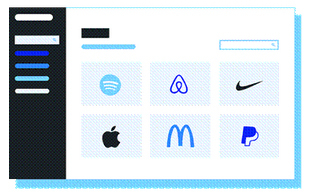 Every day, new tools are launched that are designed to make our job a little easier. With so much choice available to us it can be difficult to know exactly what tool is the one best suited to your needs. 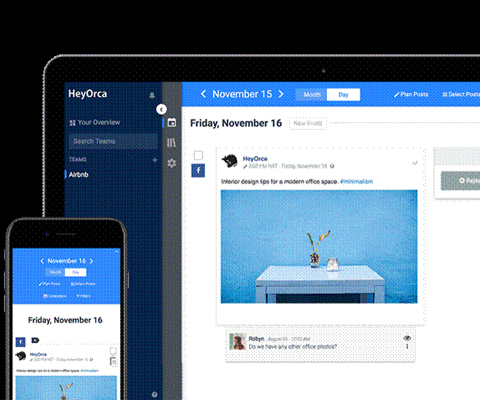 The first tool we’ll be looking at is HeyOrca, an online social media planner built for marketing agencies. For a variety of reasons I’ve spent the last few months flipping between social content tools to meet the needs of my clients at Dynamo PR. I’ve been a simple Google Sheets advocate for many years, mostly because it’s available for everyone, customisable and whilst there are some things about it that frustrate me, its simplicity outweighs the frustration every other social content management tool has caused me. Am I about to change my mind? What this tool does: HeyOrca is an online social media planner built for marketing agencies. It helps cut delays in client approvals and eliminate redundant tasks. Built specifically for marketing agency professionals who are tired of using spreadsheets and other general-purpose tools to manage their daily social content across multiple brands and channels. HeyOrca allows you to manage all content approvals and all clients with one tool, making content planning seamless and streamlining your social media production workflow. The test: Our client has recently launched a new Twitter profile, that has a growing audience, but is still establishing elements of its offering, with content pillars evolving as months go by. Copy approval requires feedback from a number of stakeholders, based in locations around the country. We post daily and content is approved four weeks in advance of publication. The process is usually a challenge, but by no means impossible. We wanted to see could HeyOrca make our job easier? What we asked this tool to do: There didn’t seem to be any need for us to go to extremes to test HeyOrca, its simplicity is one of its main attractions. The biggest challenge we face here as a team is co-ordinating feedback from clients and securing approvals within their hierarchies..
How it performed: The process couldn’t have been smoother. From the simple planning of when posts go live, delegating copy and asset management (we actually uploaded ALL our available content to HeyOrca meaning when we come to draft next month's content we can simply select and add), the clean, clear layout meant that even for a busy month of content, we were clearly able to see what was appearing on what channel on which day, and what campaigns were running during which weeks. Approvals were straightforward and we were able to reduce the amount of time we spent presenting, gauging feedback and actioning changes. 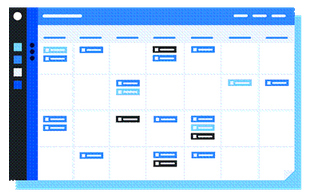 The scheduling feature meant we didn’t have to leave the platform from planning through to execution. Likes: Having everything under one roof is the real key. Before HeyOrca you could be using two spreadsheets for planning and strategy, a slideshow for asset presentation and copy approval, feedback via email, further feedback in person, scheduling through the native app... it’s a lot of plates to keep spinning!! With HeyOrca, everything is linear and streamlined. The dashboard looks clean and easy to navigate and the approval interface means we spend less time understanding what is good to publish/schedule and what needs more attention. Dislikes: A mobile app feels like it should be a given, but there isn’t currently one available. The analytics available are adequate for my needs, but some may find them to be lacking. We trialled a couple of weeks’ worth of content so from a long-term planning perspective we may still need to rely on external documents but as far as simplicity and user experience goes, HeyOrca really can’t be faulted. If you’r client is wary of using Google servers and your own email servers struggle to deal with the weight of a 155MB excel_month_v9_FINAL_CLIENT_FINAL.xls file, then HeyOrca might be the thing for you.